Behind The Famous Story, A Difficult 'Wild Truth' When Christopher McCandless died in the wilds of Alaska, his story became famous all over the world. A new memoir by his sister Carine reveals some of the reasons he chose to walk away from the world. Jon Krakauer's 1996 book Into the Wild delved into the riveting story of Chris McCandless, a 24-year-old man from an affluent family outside Washington, D.C., who graduated with honors from Emory, then gave away the bulk of his money, burned the rest and severed all ties with his family. After tramping around the country for nearly two years, he headed into the Alaska wilderness in April 1992. His emaciated body was found a little over four months later. Krakauer's book struck a nerve with readers. But he never fully answered what motivated McCandless' ascetic renunciation, and the book drew scores of letters accusing him of arrogance, ignorance and selfishness. In a fascinating 2013 followup article in The New Yorker, Krakauer finally confirmed the cause of McCandless' death: a toxic amino acid in wild potato seeds, previously thought to be benign. He hoped that the new findings would squelch some of those accusations. Now Chris' younger sister, Carine McCandless, 21 at the time of her brother's death, has come out with The Wild Truth, which tells a story as poisonous as wild potato seeds. Her memoir reveals what Chris was running from — and should lay to rest allegations that her brother's behavior was cruel to their parents. Carine McCandless gets the grim truth out of the way up front in her introduction, with the quick determination of someone tearing off a painful Band-Aid: She and her brother Chris grew up with a volatile, viciously abusive father who made their weak-willed yet hyper-competent mother both his victim and his accomplice. Carine, who was a valuable source for both Krakauer's book and Sean Penn's movie adaptation, had shared this dark family history with Krakauer back in the early 1990s, though strictly off the record in order to protect her parents "from full exposure in case they could change for the better." (Not surprisingly, they didn't.) And even though it compromised his book, Krakauer honored Carine's restrictions. Instead, he hinted at the truth with repeated allusions to an "overbearing" father, which some readers caught, though many did not. Did Jon Krakauer Finally Solve 'Into The Wild' Mystery? 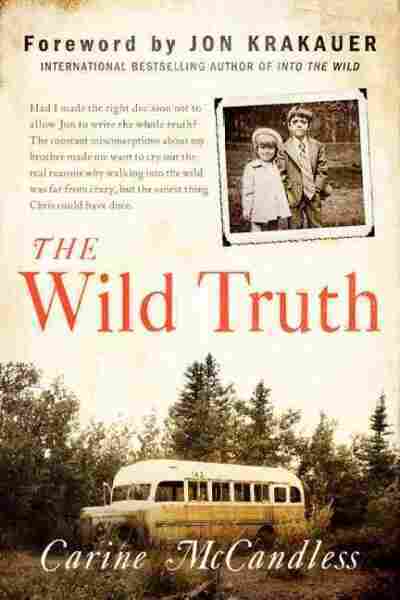 The Wild Truth opens with several harrowing scenes. After vividly describing one of their father's attacks on her mother, McCandless moves on to the double beatings she and her brother suffered, "forced down, side by side" across his lap. She writes, "The snap of the leather was sharp and quick between our wails. I will never forget craning my neck in search of leniency, only to see the look of sadistic pleasure that lit up my father's eyes and his terrifying smile — like an addict in the climax of his high." Fortunately, McCandless — while searingly honest — doesn't sustain this level of distressing intensity, or I doubt I would have been able to make it through. What she does do is chronicle Billie and Walt McCandless' miserable wine- and gin-fueled marriage and its lasting repercussions on their children. In her efforts to present a balanced picture, Carine flags happier times, too — like the camping trips her brother loved. Family photos paint a sunnier picture, though she makes clear that these command performances were part of an elaborate false front. Billie and Walt's relationship began at Hughes Aircraft, where she was a young secretary and he was her married boss, a rising star electrical engineer. In the next few years, he would father two more children with his wife, Marcia, and two with Billie — Chris and Carine — while brutalizing and lying to both women. When Carine was 1 year old, Marcia finally escaped with her six children. But although Billie repeatedly vowed to leave Walt, raising her children's hopes, she never followed through. The Wild Truth moves swiftly from Carine's closeness with her brother — invariably pictured hugging her protectively — to a candid (though, not surprisingly, less compelling) account of her lifelong search for unconditional love and self-worth through three marriages, close bonding with her half-siblings, devoted motherhood and owning a successful business. Interestingly, she accepts her beloved brother's abandonment without bitterness, seeing it as an unfortunate casualty of his clean break with their parents. The Wild Truth is undoubtedly a "courageous book," as Krakauer asserts in his gracious foreword, and Carine McCandless comes across above all as a resilient survivor. It lacks the resonance of great literature (including Into the Wild ), which less focus on her marriages and a deeper exploration of the journalistic ramifications of restricting information, or of the psychology of abusers might have provided. But The Wild Truth is an important book on two fronts: It sets the record straight about a story that has touched thousands of readers, and it opens up a conversation about hideous domestic violence hidden behind a mask of prosperity and propriety.